The web is moving from being a collection of pages toward a collection of services that interoperate through the Internet. A fundamental step toward this interoperation is the ability of automatically locating services on the bases of the functionalities that they provide. Such a functionality would allow services to locate each other and automatically interoperate. 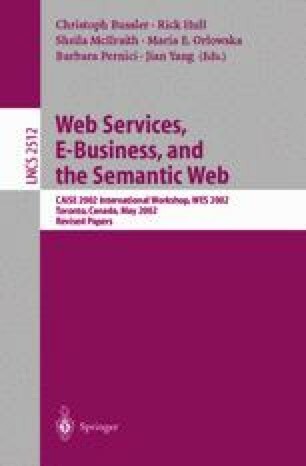 Location of web services is inherently a semantic problem, because it has to abstract from the superficial differences between representations of the services provided, and the services requested to recognize semantic similarities between the two. Current Web Services technology based on UDDI and WSDL does not make any use of semantic information and therefore fails to address the problem of matching between capabilities of services and allowing service location on the bases of what functionalities are sought, failing therefore to address the problem of locating web services. Nevertheless, previous work within DAML-S, a DAML-based language for service description, shows how ontological information collected through the semantic web can be used to match service capabilities. This work expands on previous work by showing how DAML-S Service Profiles, that describe service capabilities within DAML-S, can be mapped into UDDI records providing therefore a way to record semantic information within UDDI records. Furthermore we show how this encoded information can be used within the UDDI registry to perform semantic matching. ISO/IEC 11578:1996. Information technology — open systems interconnection — remote procedure call. http://www.iso.ch/, 2001. US Census Bureau. North american industry classification system (naics). http://www.census.gov/epcd/www/naics.html, 1997. Erik Christensen, Francisco Curbera, Greg Meredith, and Sanjiva Weerawarana. Web Services Description Language (WSDL) 1.1. http://www.w3.org/TR/2001/NOTE-wsdl-20010315, 2001. DAML-S Coalition. Daml-s 0.6 draft release (december 2001). http://www.daml.org/services/daml-s/2001/10/, 2001. DAML Joint Committee. Daml+oil (march 2001) language. http://www.daml.org/2001/03/daml+oil-index.html, 2001. RosettaNet. RosettaNet Web Site. http://www.rosettanet.org, 2000. UDDI. The UDDI Technical White Paper. http://www.uddi.org/, 2000. W3C. Extensible markup language (xml) 1.0 (second edition). http://www.w3.org/TR/2000/REC-xml-20001006, 2000. W3C. Soap version 1.2, w3c working draft 17 december 2001. http://www.w3.org/TR/2001/WD-soap12-part0-20011217/, 2001.